In this webinar Dr Len Drury discussed the on-going hydrogeological assessment work in the Myanmar Eastern Highlands (opposite China, Laos and Thailand). Complexities of the geological structure of Central Myanmar, such as major earthquake zones, numerous basins and sub-basins as well as oil and gas fields, contributed to the difficulties of groundwater exploration. Work in such logistically difficult locations is only possible through strong support by government, military, community groups and non-government organisations. This was the 5th webinar in the Groundwater Series presented by GRIPP, NCGRT and ICE-WaRM. We are delighted to have Professor Okke Batelaan from NCGRT/Flinders University who has given a brief summary of this Series and joined Len on the Q&A Panel for this webinar. 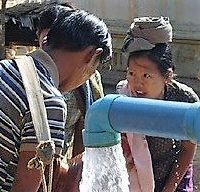 The groundwater resources of the Dry Zone, central Myanmar, has been the focus of an Australian Water Partnership project led by Dr Drury. Potable groundwater is of extreme importance to the development of the nation and socio-economic welfare of its people. There is currently no groundwater legislation or regulation to mandate monitoring and management of the regional groundwater resource.